After several years of baseball-themed birthday cakes for my husband, this year I mixed it up. We have finally put up our birdfeeders at the new house, including a suet feeder right outside our sliding door, so we’ve had lots of bird watching time. The kids especially are really into it. 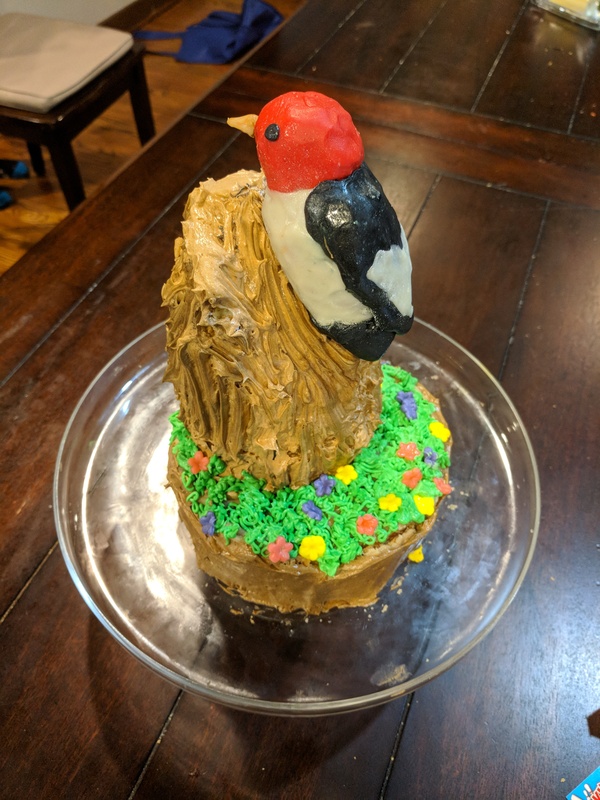 So I decided to cake my husband’s favorite bird, the red-headed woodpecker. 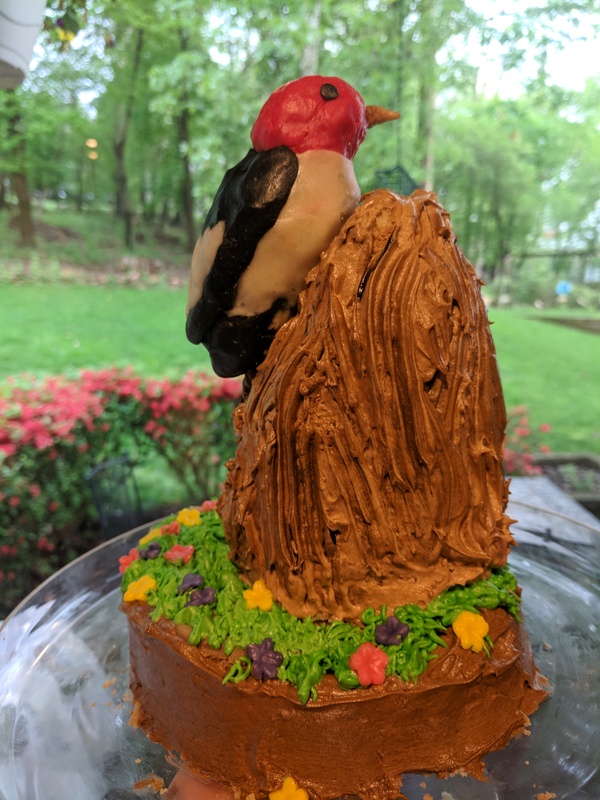 He requested caramel frosting, so I thought I’d use that to make bark on a tree on which the bird could be perched. The larger cake was the base, and I stacked 3 of the the smaller ones, slicing and stacking the top layer to make an angle. 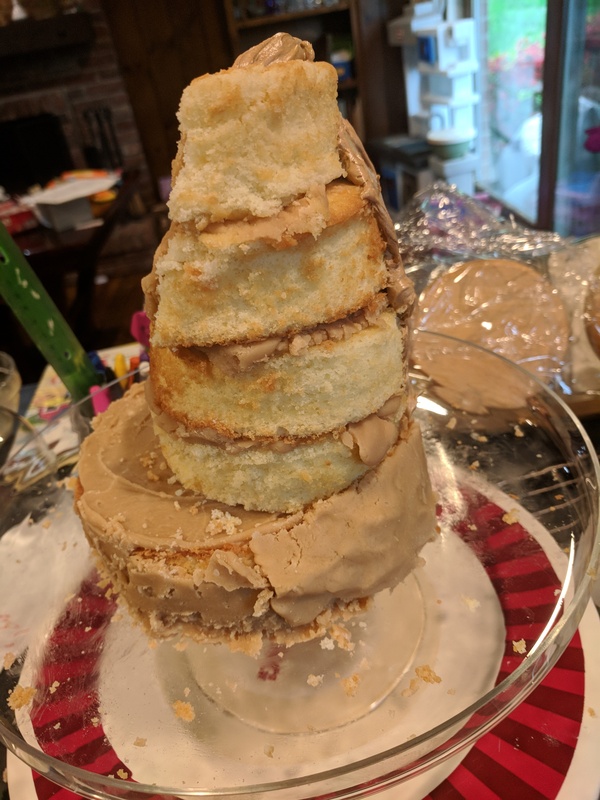 I used the same caramel frosting recipe as the mane for the lion cake, which was enough to awkwardly cover the base and to put between the tree trunk layers, but it clearly wasn’t enough to go around the whole tree. I decided to supplement with white chocolate frosting. 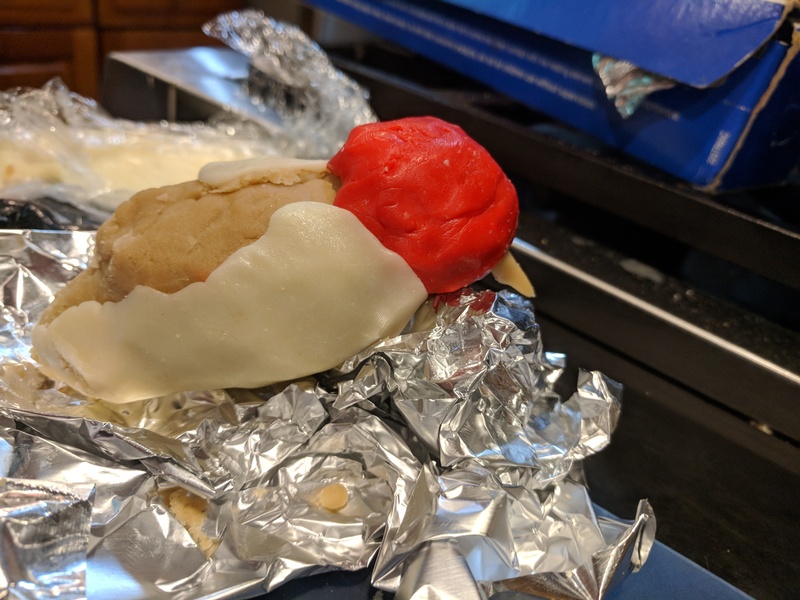 I took half of the remaining 4-inch layer and some of the caramel frosting to make cake ball dough, and I sculpted that into the shape of a red-headed woodpecker, roughly, as best I could tell from a google image search. 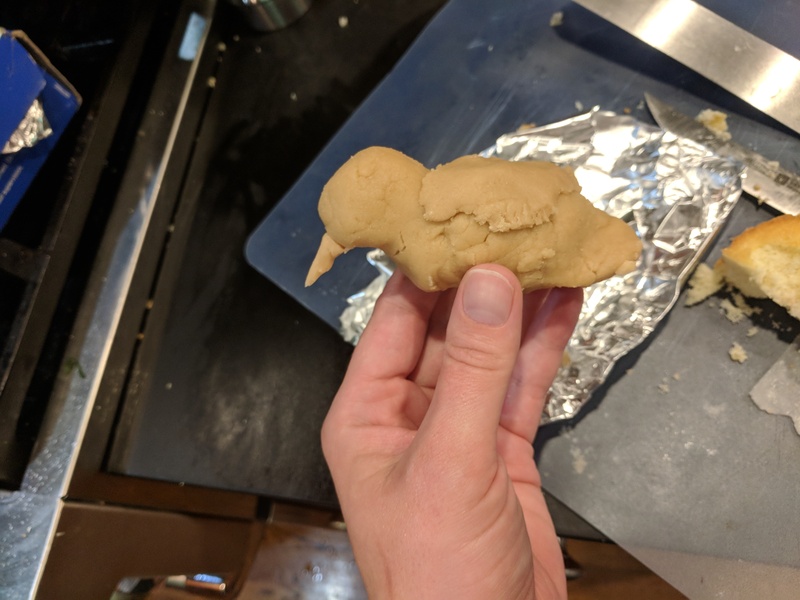 I made white modeling chocolate yesterday just in case I needed it, and it turned out to be the best way to color the bird. Red for the head (obvi). The uncolored chocolate is off-white than I’d have liked, but I never think to buy white food coloring (Note to self: buy some). 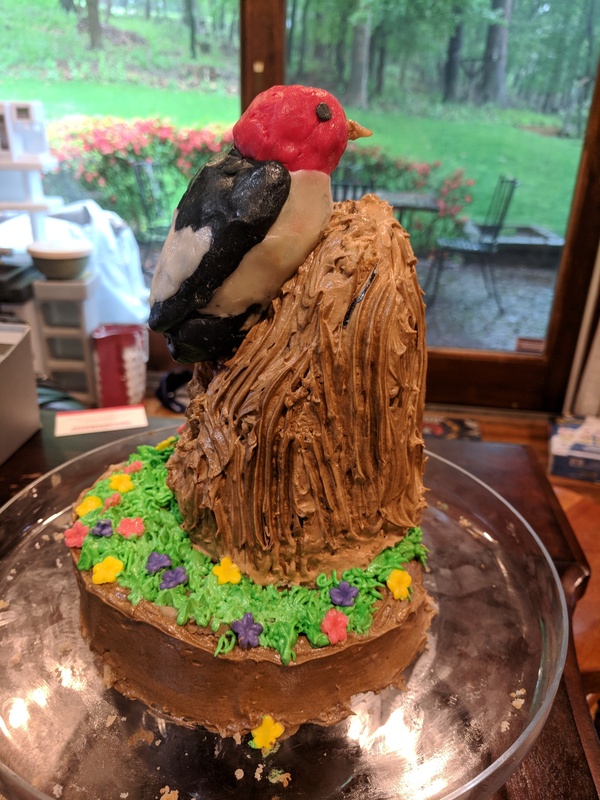 I added a little bit of white pearl dust, but by the time it was contrasted with the black wings and the brown tree (which was my white chocolate frosting dyed brown, because chocolate gives my husband migraines), it looked fine. For the tree trunk I just dyed the frosting brown, glopped it on, and used a fork to texture it. I colored the leftover modeling chocolate pink, yellow, and purple, and used my Wilton set to cut out little flowers, and piped some white chocolate frosting grass on. The bird was attached with wooden skewers. It split the cake pretty badly and I was sure we’d come home from dinner to a crumbled mess, but somehow it held. And the best part is, the bird (once the skewers were removed) was entirely edible! I can’t believe it . . . truly breathtaking. 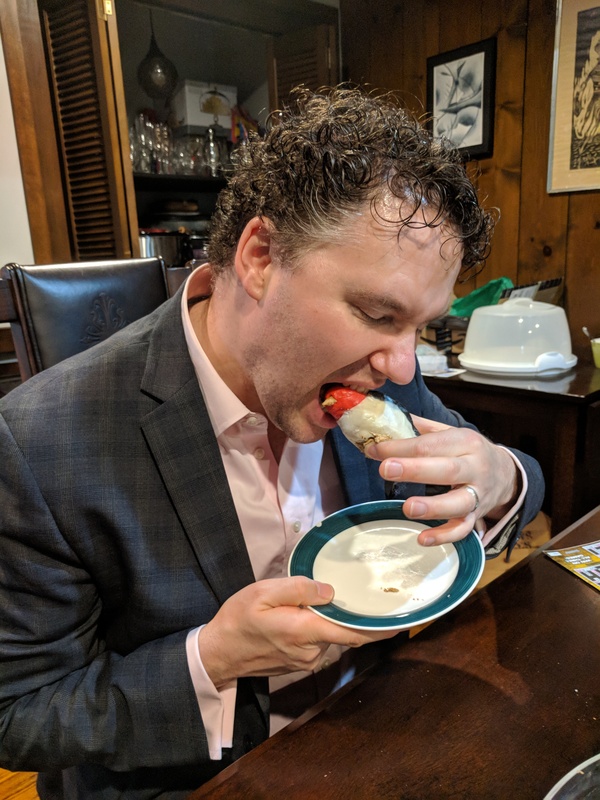 And I can’t believe that Anthony ate the head!